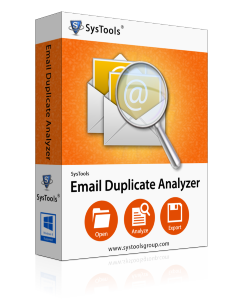 Demo version of Email Duplicate Analyzer tool only find duplicate emails in Outlook emails and shows summary of duplicate emails in selected PST files. If you are using Window 10/8.1/8/7 or Vista, then please launch the tool as "Run as Administrator"
How Can I search duplicate emails in Outlook by Using this, Duplicate data finder Software? Using this utility, user can easily find duplicate emails in Outlook 2016, 2013, 2010, 2007, 2003 & 2000. How to find duplicate emails in Outlook 2016, by using duplicate mail finder software? By using this, Duplicate data finder software you can easily find duplicate emails in Outlook 2016. 2013, 2010, 2007, and all below versions. Also, search for duplicate emails in Microsoft Outlook 2007, 2010, 2013, etc. Do I need to have MS Outlook installed on my machine for finding duplicate emails in Outlook? Yes, MS Outlook should be installed on your machine to use the Outlook duplicate email finder software. The find duplicate copies of emails Outlook tool is compatible to search and find duplicate emails in Outlook 2016/2013/2010/2007/2003/2000 data in both 32 bit & 64 bit versions. Does the search duplicate emails in Outlook software support both ANSI & UNICODE Outlook Data File formatting? I have two different ANSI & UNICODE PST files and I want to eliminate duplicate items from it. Will the software be able to do this? Yes, Outlook duplicate email finder software to search duplicate emails in Outlook PST File is capable of analyzing and removing duplicate items from both ANSI & UNICODE PST File types. First, the find duplicate emails in PST tool will read PST files one by one & then both files altogether to check for duplicate items within them. .
Will the Duplicate data finder software eliminate duplicate items or make a new file for duplicates? First, the software will check and search outlook for duplicate emails within the PST file. If duplicates are found, the software will export PST file data in two files: a fresh PST file without duplicates and another PST file consisting of the duplicates. Does the Outlook duplicate email finder software support corrupt PST file to export duplicate items? Yes, the duplicate mail finder software to find duplicate emails Outlook in PST files supports corrupt PST files as well as password protected file to analyze & eliminate duplicate items from. Does the software find duplicate emails Outlook in batch? Yes, duplicate mail finder Outlook software, find and search duplicate emails Outlook at once in an effective way without consuming much time.